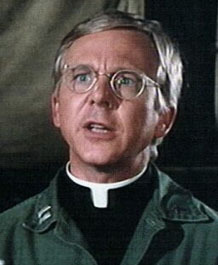 William Christopher who died on New Year’s Eve was best known and loved for his role as Father Mulcahy in the epic US television series M*A*S*H.
His casting epitomised the skill of the producers in finding the perfect actors for the roles with the depth to ensure the show’s longevity. Coming to the show in 1972, he was the ultimate pacifying piece in a jigsaw of characters which did so much to show its audience the true effects of war, the casualties and the lives of those forced to take part and he was given a number of opportunities to star in his own right as the main subject in a number of episodes. One of many ‘foils’ to Alan Alda’s Hawkeye Pierce, he brought a comedic charm to the storyline, a man of the cloth who understood the reality of the human race in not only a conflict zone but an enclosed environment in which relationships formed and fell apart. His was a sympathetic view on those who wandered from the spiritual path, Mulcahy was a progressive priest and the balance between spreading the word to a 1970s audience in a 1950s setting was balanced and often thought-provoking. It was a part well acted, for many of us of a certain age he was a staple sight in our television viewing and for me, a reminder of a golden age in situation comedy. M*A*S*H was more than a sitcom, its huge viewing figures proved its status as a significant constant in many people’s lives and William Christopher as Father Mulcahy regularly delivered the important messages which programmes such as these delivered with brilliant subtlety. Whilst he never went on to achieve the levels of success he had known with M*A*S*H he will be remembered with fond affection by anyone who looked forward to the opening music and chopper scenes of that most iconic of television series. William Christopher died of lung cancer aged eighty four.